DCS Chocolates loves to cater to our customers’ individual tastes and desires. 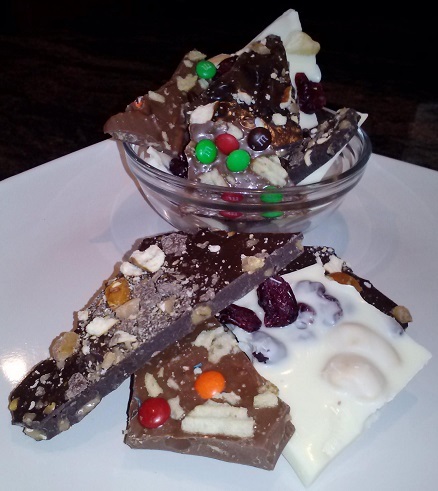 So…we now offer our Customized Chocolate Bark. You can build you own bark by picking your chocolate base along with the toppings to be added in and sprinkled on top. The possibilities are endless!!! Each order contains approximately 1 pound of chocolate and approximately 1/2 pound of toppings all wrapped in our signature gold bag. Not sure where to start with your creation? Here are a few suggestions for previous customers. ~Dark Chocolate with pretzel pieces and toffee heath bar crunch! ~Milk Chocolate with mini m&ms and crushed potato chips! ~White Chocolate with cashews and dried cranberries!